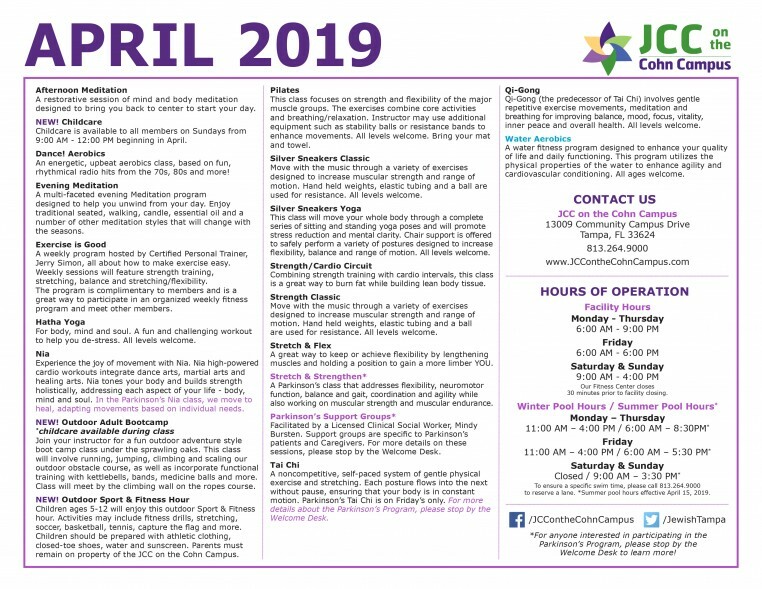 The JCC on the Cohn Campus health and wellness program offers you a complete fitness program no matter what your fitness level may be. Our newly renovated fitness center, which includes new cardiovascular equipment, free weights and weight machines, new flat screen televisions, and remodeled locker rooms, all in an updated, functional open space. We welcome and invite the community to come and tour our facility. We offer a wide variety of fitness classes for people of all fitness levels including Zumba Basic, Vinyasa Yoga, Hatha Yoga, Stretch & Flex and Tai Chi. Get fit and join us! Join us for a variety of specialty classes and interactive workshops offered throughout the year, including healthy living classes, boot camps and self-defense courses. The JCC on the Cohn Campus offers a variety of classes for seniors with the SilverSneakers® Fitness Program, an innovative health, exercise and wellness program helping older adults live healthy, active lifestyles. Get fit, have fun, make friends! We offer SilverSneakers classes including YogaStretch, Muscular Strength & Range of Movement, and Silver Splash.